Readers preparing to work in hospitality will enter a field that is quickly evolving. The rise of the global economy, ecotourism, internet commerce, and changing consumer demands are just some of the factors they will be dealing with in this exciting and dynamic industry. This new edition gives readers the foundation they need to thrive in today's hospitality industry, covering everything from finance to operational issues. The Eighth Edition of Introduction to the Hospitality Industry features both historical perspectives and discussions of new trends in a variety of sectors of the hospitality business, including food service, lodging, and tourism. Additional international examples of hospitality and tourism operations have been included throughout the text. This book covers all the latest trends, challenges, and opportunities in the hospitality industry. Readers will have a strong overview of the industry, where it fits into the broader world, the major issues and challenges in the field, and the many possible career paths that await them. Clayton W. Barrows is the author of Study Guide to Accompany Introduction to the Hospitality Industry, 8th Edition, published by Wiley. 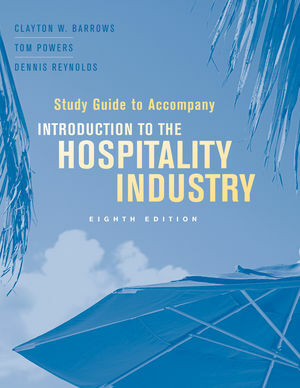 Tom Powers is the author of Study Guide to Accompany Introduction to the Hospitality Industry, 8th Edition, published by Wiley.